Addis Ababa (HAN) March 28, 2014 – Members of the Pan-African Parliament appreciated the role Ethiopia has been playing to keep peace and stability in the Horn of Africa. In an exclusive interview with the Ethiopian News Agency in South Africa, members of the Pan-African Parliament said Ethiopia has been playing a prominent role in resolving conflicts peacefully in the continent in general and in East Africa in particular. 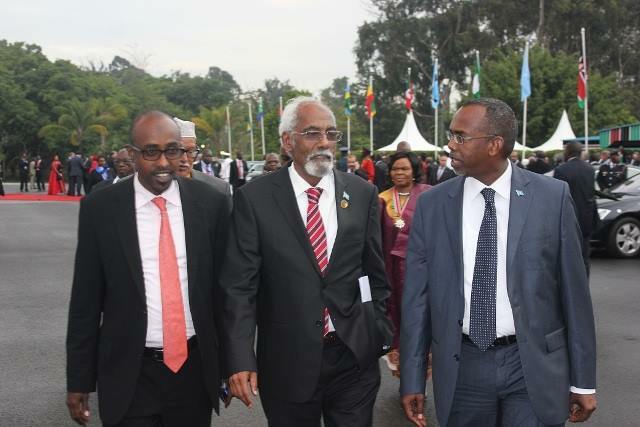 Somalia MP and Pan-African Parliament member Abdisemed Hassan said Ethiopia’s firm stand to resolving conflicts and instability peacefully is appreciable. Besides striving to permanently resolve conflicts in different countries, including Somalia, Ethiopia has fulfilled its continental responsibility by deploying peace keeping forces, he explained. Abdisemed added that Ethiopia’s leading role in the strengthening of African unity gives it deservedly a prominent place. Zambian MP and Pan-African Parliament member, Patrick Mucheleka on his part said Ethiopia has been playing a unique role in diffusing conflicts and keeping peace in the African continent. Sudanese MP and Chairman of Eastern Caucus in the Pan-African Parliament, Professor Awad Hadji Ali Ahmed said Ethiopia is honored for the prominence it gives to Africa in the parliament. Professor Ahmed, who said the building of the Great Ethiopian Renaissance Dam will not harm any of the downstream countries, added that it instead consolidates peace in East Africa by integrating the electric power infrastructure of the riparian countries. The world should not expect any conflict resolution from Ethiopia. Reason is if the same country is not able to resolve its own local and regional problem how could be possible to see problems resolved of other country. Ethiopia is not able to resolve its problem with the Oromos, Somalis, Afars, Amharas, Tigres…… and the name goes on and on. Ethiopis is not able to hold its agreement on resolving the border issue with Eritrea, although the Border commission has issued its verdict years ago. Yet holding sovereign Eritrean land. Border issue with Kenya is still hot. Although the folks on power try to cover it. Border issue with Sudan is given its light to Ethiopians with in Ethiopia and in Diasporas. Somalia’s intervention by Ethiopian Army is the most hotly debated issue. These are only the higlight.